How to download YouTube videos without using any programs! 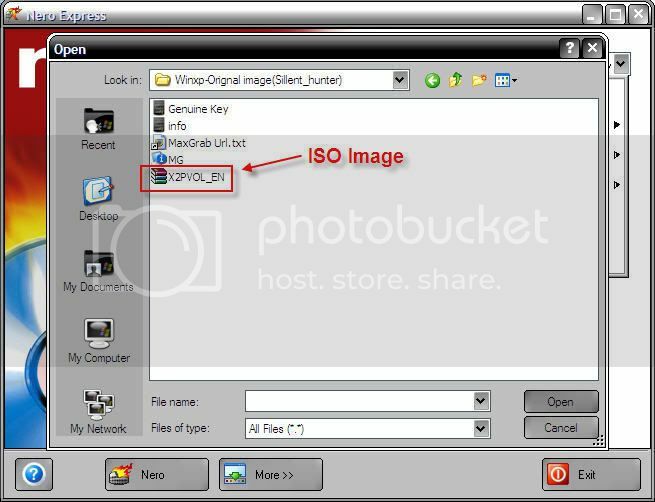 Here is a tutorial for How to download YouTube videos without using any programs!. It is very useful. The videos downloaded are in .flv format so dont forget to donwload flv player. TUTORIAL: How to download YouTube videos without using any programs! Go to the YouTube video's page that you want to download. Right-click the screen and click "View Source", or something similar, depending on your type of browser. Open "Find" (Ctrl+F) and search for "video_id=" (without quotes). After this is found, highlight the text from "video_id=" to the end of "title" (without quotes, and DO NOT include the equal sign at the end of title). In your browser, type in: "www.youtube.com/get_video?" (without quotes). Paste the text you copied earlier at the end of the question mark. Go to this URL. 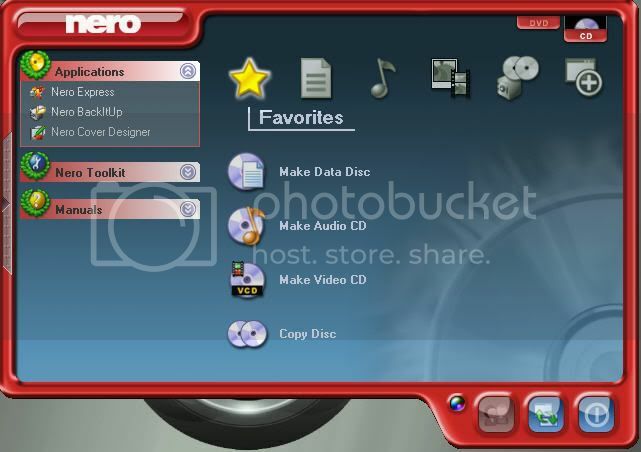 A box will open up with options to "Open" "Save" or "Cancel" the download of the file: "video.flv"
You can merely watch it anytime you want (online or offline) or you can reupload it to your account (please only do so with owner of the video's permission, to avoid copyright infringement). If you have to wear a tie on a regular basis, it might as well be awesome. In that spirit, Argentina’s “Sinapsis” studio designed this “After Office Tie” for a recent DesignBoom.com competition. It’s a simple concept that makes a lot of sense: a tie with a bottle opener built into the bottom of it. The tie will be exhibited at London’s Institute of Contemporary Arts from September 30th to October 4th. Whether it’ll become an actual product someday is another story. I could see people buying them, though. Or you could probably make your own if you’re ambitious. Panasonic's KX-TG9382T phone will only make your life easier. Thanks to its Bluetooth connectivity you can forward your contact details (names, numbers, etc.) from a mobile phone to a home phone via Bluetooth (two way mode), and provides the capability of using a Bluetooth headset or hands free solution with a phone. Only available in the US, phone will sell for around $169.95 USD. This beautiful pair of ceramic speakers, designed by Joey Roth, “are designed to leave the sound untouched, warm, dry, and detailed.” The handcrafted 4″ speakers are made of porcelain and cork, which the product’s page calls “acoustically dead.” I think that’s a good thing. gSelect sells the porcelain speaker set for $500 (USD); unfortunately it’s out of stock as of this writing. You may want to head on to its product page anyway so you can leave your email address and be notified when the product is available again. Siemens did a major makeover on its range of home appliances that went on display at IFA Berlin 2009. Besides its iPod-like disc controls for induction hobs and cooking ranges, its pioneering liftMatic oven also went under the knife for a appealing new look. The new oven is available with stainless steel/black glass panel and features Siemens’ award-winning light control system. 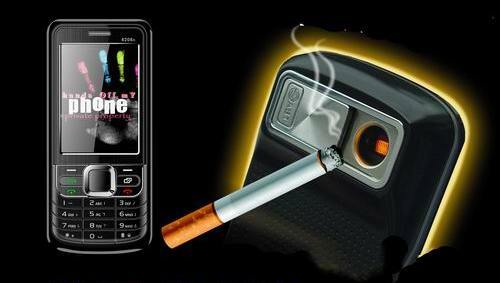 The MP3 player-like push buttons, are arranged in a logical order for utmost convenience. The oven features 11 heating methods: defrosting, top and bottom heating, hydro shoes, bottom heat, speed, 3D hot air, convection grill system, barbecue area, pre-heating and keeping warm. The other features include automatic self-cleaning, cookControl with 34 cooking programs, precise temperature control in 30°C to 300°С range, child lock and interior light. The oven sells for approx. $4,400. How often do you change lightbulbs? Every few months, maybe? Well, when Panasonic's new LED bulbs hit shelves, change that time frame from months to decades. Yes, these insanely efficient bulbs keep shining and shining, providing the brightness of a traditional 60-watt bulb. Of course, they won't be cheap, with pricing set at about $40 a bulb in Japan when they hit stores in October. But seeing as they cost a mere $2 to run per year in energy costs and last 19 years, that seems like a good deal in the long run. The Sony 32GB MicroVault Click benefits from a simple, elegant design – no cap to lose – and trouble-free plug & play operation. With its huge 32GB capacity on tap, it’s now an easy matter to transfer heavy contents between devices. The MicroVault Click range has a bright design, with one colour per capacity via an LED indicator light. The MicroVault Click can even go beyond the 32GB mark thanks to unique Virtual Expander data compression software pre-loaded onto each unit. This gives people the option of tripling capacity with a simple drag and drop function. The colourful line-up offers Hi-Speed USB 2.0 data transfer and storage capacity of 4GB, 8GB, 16GB and 32GB. This USB Windows Icebox gadget is pretty…ahem…cool. Just plug it into the nearest USB port of your PC, and it will immediately freeze any changes on the hard disk. You can keep using the computer – or let your kids run free on it – safe in the knowledge that when you switch off next, all changes will be deleted and the machine will return to its original state. It’s an excellent tool for keeping your laptop clean while letting someone else use it. Better yet, you can specify that certain folders are exempt, so you can still, for example, save docs to your word-processing folder. Neato. $18.99. 1.Freezing partitions: to freeze the designated partition of hard disc. 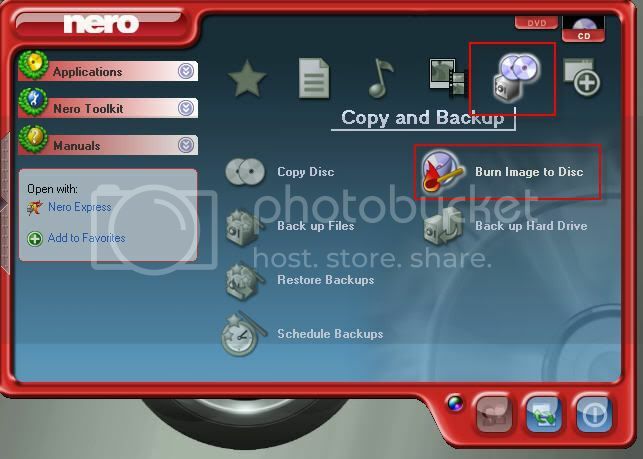 (All the operations are temporary; when the computer is shut off; all the data will got recovered) (It means you can still have normal operation just that when you shut down your PC, it will recover the the previous status unless you have the dongle plugged and change the settings) 2.Open directories: the directories in frozen partitions (e.g. my document and desktop) are frequently used, so they can be set as “opened directories” so that it STILL can be rewritten and saved and it will not influence your normal operation habit. Mobile Mechatronics is introducing what they say is the first iPhone to Tripod Adapter. Whether they’re first to market or not their concept seems sound. Take a mini tripod, add a bracket to hold your iPhone and eliminate those blurred photos from shaking the camera while taking pictures or video. They’ll also soon have an iPhone application that enables picture delay, multi-picture taking with adjustable delay, time lapse and level. 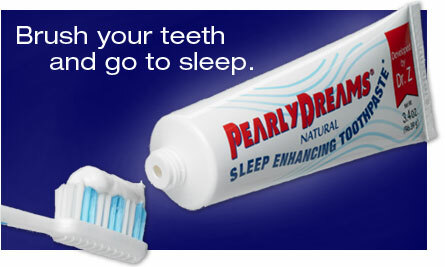 Pearly Dreams toothpaste was made to help you sleep. In other words, brush your teeth with this stuff and say goodnight. You’ll be lucky to make it to your bed. Containing a cocktail of Melatonin, Balm Mint, Valerian and Passionflower and endorsed by Aerosmith’s Brad Whitford (wtf? ), Pearly Dreams promises a long night of unconsciousness. Or you can just drink until you pass out like usual. I wouldn’t trust having this in my bathroom. Knowing my luck, I’d use it right before a date or something and wind up half-alive at dinner instead of potentially getting laid. 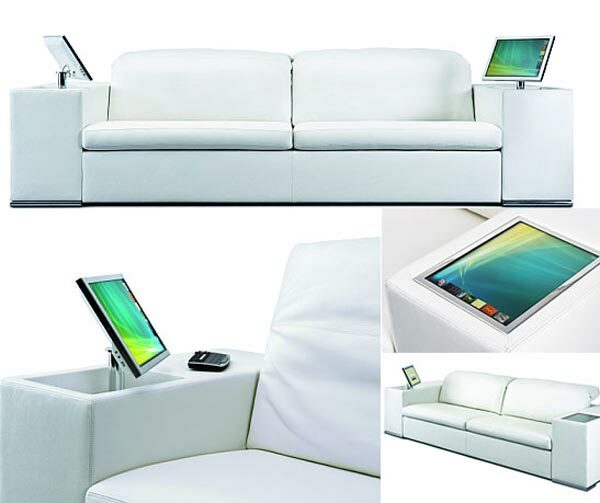 This modern upholstered sofa is a hybrid model of electronic entertainment and comfortable sofa. Athena is a multimedia upholstered sofa that features an integrated computer into it’s cool design. It includes an integrated computer, an iPod/iPhone dock, MP3 player with a wireless connection over the 2.4 Ghz radio signal, an 8 inch subwoofer and series of loudspeakers. I’m pretty sure that most of you don’t want a piece of furniture so sopistichated like this, but for those of you who want it the luxury though comes for an eye-popping price of approx. $15,436, which seems like a bit over the top in these hard times. But, then this designer furniture is meant strictly for the elite of society. You can find more about this piece of furniture from Artanova. Microsoft has taken the wraps off an amazing offer for UK and US students today. Students in the UK and US with a valid email address (an email address given by the college or university, e.g. 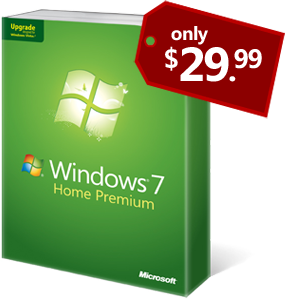 name@leeds.ac.uk) will be able to purchase Windows 7 Home Premium or Windows 7 Professional (upgrade versions) for £30 and $30 respectively. The offer will run until 3 January 2010 when the prices will revert to normal. Microsoft confirmed the offer in an email to Neowin, "students will benefit from many of Windows 7's unique functions and applications which make PC's easier, simpler and more fun to use. For those students who have the latest laptops with touch screen technology, Windows 7 comes with enhanced capabilities for an enriched touch experience, allowing a more direct and natural way to work – it's also perfect for netbooks. Other features include remote media streaming, improved gaming experience, enhanced security and integration of Windows Media Centre for more central and convenient management of music, movies and photos. "To take part in this offer please see more information at the Windows UK Student Offer site or the Windows US Student Offer site. Here’s a Web site that understands how fellow travelers and tourists think, it’s appeal lies in giving you a flavour of the whole course, instead of focusing on the small tidbids. Ruba is a travel Web site where community-generated user reviews share travel experiences that span across cities, countries and continents. The user guides are pictorial, with geo-tagged locations on Google maps that give you precise location of the landmarks, restaurants, and tourist attractions. The Web site also links you to some of the best travel blogs, providing you with an excellent starting point for future adventures. Bolohealth.com is a networking portal for health enthusiasts. It provides a platform for users to create their own community, and to exchange views and opinions with medical professionals. The Web site helps you find a doctor or hospital in your vicinity, listing over 1,00,000 doctors, and 10,000 healthcare establishments in India. The portal also has a comprehensive listing of major illnesses and medical conditions, with a panel of experts who regularly blog on the site. An antidote to all the doom, gloom and pessimism in mainstream media outlets, this news Web site is like a dose of prozac, covering only positive news stories and inspiring features on travel, sports and companies with a conscience. A section dedicated to charities tries to raise funds for various causes, from research funding to disability and Alzheimer’s. 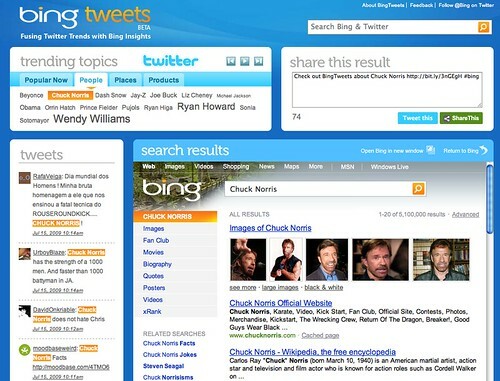 Microsoft announced a new portal that combines Bing search and Twitter. The new site is named BingTweets and it basically brings together classic web search from Bing, with real-time search elements from Twitter. This service was built by both Microsoft, Twitter and Federated Media. It does not seem like Twitter is doing anything more than just providing access to their public API to Microsoft and Federated Media. By just visiting BingTweets, the results will dynamically show a popular search query, but you can override that query with whatever you like. The topics on the home page in the “trending topics” change every 30 to 60 minutes. If this service becomes something popular and Microsoft deems it as useful, they may integrate this directly into the default Bing experience. Evidently, Google’s efforts to create a new CAPTCHA system that requires people to rotate images until they’re upright, aren’t moving as quickly as the company would like. Because this morning, the search giant said it had acquired reCAPTCHA, developer of the Web’s preeminent CAPTCHA technology. Terms of the deal were not disclosed. CAPTCHA, for those of you just joining us, stands for Completely Automated Public Turing test to tell Computers and Humans Apart. 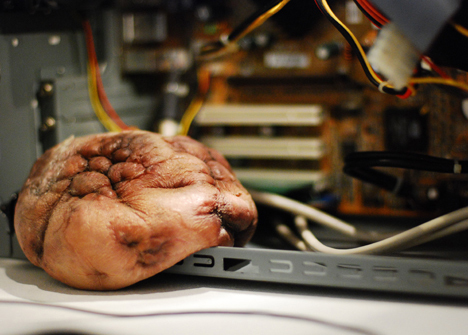 Essentially, it’s a challenge-response test used to distinguish between humans and spam-spewing robots. What’s interesting about reCAPTCHA’s implementation is that it’s used for digitizing books. An ingenious idea, crowdsourcing book transcriptions in this way. An effective one too: reCAPTCHA boasts 99.5 percent accuracy at the word level. Little wonder, then, that Google (GOOG) has acquired it. The company can clearly put reCaptcha’s technology to good use, not just as a security measure, but as a means of improving its own massive book-scanning project. Facebook has two very big pieces of news that they announced today at TechCrunch50. The first: They have crossed 300 million users worldwide now, extending their lead as the biggest social network. The second: They are now cash flow positive. Yes, from this point forward, Facebook is making money. 300 million is the obvious big news. But really, it was always just a matter of time before Facebook was going to hit the milestone. They hit 250 million back in July. Really, the much bigger news is the second item. Back in April, we noted that while the company has been EBITDA profitable for several quarters in a row, they weren’t expecting to go cash flow positive on an operating basis until 2010. Back in 2008, there was roughly a $200 million gap between Facebook being cash flow positive and their EBITDA numbers. So why was it going to take another 2 years to close that gap? It’s likely because Facebook has been spending a lot of money over the past couple years on things like servers, but accounting rules allowed them to spread those costs over time. But the amount of money they’re pulling in has either eclipsed those costs earlier than expected or it isn’t spending as much. (Equipment spending for big storage servers tend to be lumpy). Undoubtedly, projects like Haystack, which aim to cut the costs of sharing photo storage on Facebook have helped quite a bit. Aside from being the biggest social network, Facebook is also the largest photo-sharing site as well. Again, blogger buzz informs that now blogger has added one new feature to their machine, it is the avatar beside the comment. 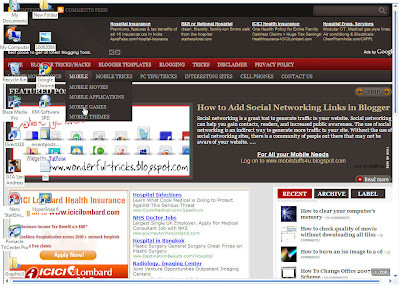 It’s said that this feature is to complete any new features in celebration of Blogger’s birthday. 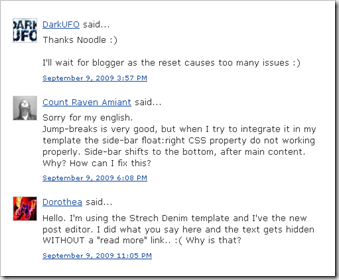 If the comment avatar has not appeared yet in your blog, maybe your template has not supported this new feature. But don’t worry because you can add a modification to your template so you can solve this problem and Blogger Avatar will appear. The important thing is that Blogger has provided the facility to their machine. For Blogger Developer, we’ll wait for any other new feature so blogger manias will be confident to use your machine.. Go..go..go.. blogger. It often happens our computer to operate its work very slowly.Most of people restart computer, but we have another simple method to proceed without restarting your OS. Now whenever you see that your PC is working slowly go to this icon and click it, without restarting PC would clear your memory and speed up processes. Then extract remembering to check the "Keep broken file" tab then play the file. For guide how to do it how a look at the above image. 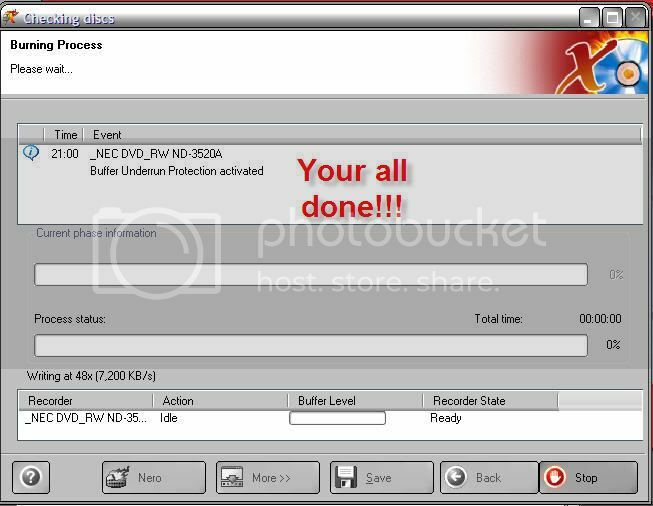 This tutorial will help you burn an image to a cd. For this tutorial I will be using Nero because its the best one to use or you can use magic iso or ultra iso but for me Nero is fast. Finally, just wait til the process is done and you will have successfully burned an image to a cd.